Photos are a selection of examples made for previous customers. Custom sizing and styling usually included within general price. Price guides available contact us. Reproductions and special designs quoted. Free quotes given for custom decorations. Sorry, no designs created free on approval. 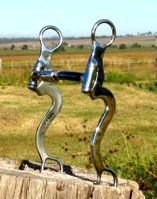 In good hands, Shank Bit leverage enables progressively lighter contact as the horse can learn to anticipate on merest signal.